The LG Q7 Plus comes with a better camera, AI, Hi-Fi audio, IP68 rating and rear-mounted fingerprint sensor. All three Q series smartphones come with 5.5-inch Full Vision displays with FHD+ (2160 x 1080 pixels) resolution and 18:9 aspect ratio. LG Q7 plus is pretty cool device with tall display and incredible camera. But it does not feel right being stuck to a single carrier for more than a year. That happens when you’ve bought your LG Q7 Plus from T-Mobile and it effects your experience with LG Q7 a bunch.Its not like LG Q7 Plus is cheap so you should have the freedom to do what you want with your phone.LG Q7 Plus is an awesome device to say the least but being stuck with T-Mobile network carrier is not so awesome. Fortunately, there is a solution for this problem. Now you can free LG Q7 Plus from T-Mobile without breaking your bank or putting your LG Q7 in harms way. Unlocking will break the network barrier in your LG Q7 Plus phone allowing it to be used on any network SIM card. The process is relatively simple. You just have to follow the procedure below to unlock your phone and enjoy the benefits of inserting any SIM card in your LG Q7 Plus phone. 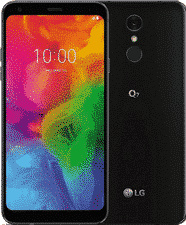 T-Mobile LG Q7+ is also known as LG Q610TA. You can also MetroPCS LG Stylo 4 unlock. How To Unlock T Mobile LG Q7 Plus? The unlocking process is completely done through the official Mobile Device Unlock App which is already installed in any T-Mobile Android phone. Unlocking LG Q7 by code is the easiest and fastest way to make your device network free. Now you can liberate your LG Q7 Plus from T-Mobile very easily. There are two safe methods to unlock LG Q7 from T-Mobile. You can ask T-Mobile to unlock your phone for free or you can buy T-Mobile device unlock app solution from us. First method have some difficult requirements, you need to be on T-Mobile for a time period set by t-mobile and you need to have good standing with your carrier and your LG Q7 plus should be paid off. And if you fulfill all the requirements you still might end up not getting your Q7 plus unlocked from T-Mobile. If you try unlocking from us you dont really need to fulfill such requirements. You can just order unlocking by filling up the form and your LG Q7 Plus will be unlocked. Mobile Device Unlock app is an application that let you request and apply a mobile device unlock directly from the device without the need to enter an unlock code. You dont really need to fulfill any big requirements. You just need IMEI of your LG Q7 Plus. You can find IMEI of note nine by opening the dialer app and type *#06#, when you dial this IMEI will appear on the screen. You can also find IMEI number by going in to settings of your LG Q7 Plus and check “about” section. You can read more about finding IMEI of your phone in blog. The other thing required for T-Mobile Device Unlock App for LG Q7 Plus is a working e-mail address, to receive unlock confirmation from us. Ordering T-Mobile Device Unlock App is simple is simple. You just have to fill up the form. First write your IMEI, make sure your IMEI is 100% correct so check it twice or thrice. After that write your e-mail address and your name and just go ahead with payment. After we’ve received your order we’ll process your request and in the given time we’ll send you unlock confirmation on your e-mail address. After you’ve received unlock confirmation you just have to connect your LG Q7 Plus with WiFi or LTE and open T-Mobile Device Unlock App, in the app select permanent unlock, after that unlock app will process your request and your LG Q7 Plus will be unlocked. Why Unlock T-Mobile LG Q7 Plus? Unlocked LG Q7 Plus will attract more buyers and network unlocked phones tend to sell easily as compared to locked phones and brings better resale value. Besides getting good money, you can switch to any network that offers better value for money and have bigger coverage area. Plus you don’t have to pay hefty roaming charges while traveling. We have discussed more advantages of unlocking phone. Unlocking will break the network barrier in your LG Q7 Plus phone allowing it to be used on any network SIM card. This is one time and permanent unlock solution for your T Mobile LG Q7 Plus locked with any carrier. This unlock is compatible with any firmware and base band version of LG Q7+ . Once you have unlocked your LG Q610TA successfully it remains unlocked even after firmware updates. There are no risks in unlocking LG Q7 Plus because unlocking T-Mobile with T-Mobile unlock app is the legal and official method and it unlocks LG Q7 Plus permanently. You don’t have to change firmware so there is no risk of damaging your phone. We have discussed more about risks involved in unlocking process. Q:Do i have to root LG Q7 Plus to unlock it? A:No, you only need LG Q7 Plus unlock app to unlock. Q:Does unlocking my LG Q7 Plus void its warranty? A:No unlocking with T-Mobile unlock app is the official method and it does not void your warranty. Q:Does unlocking Samsung LG Q7 Plus effect my contract? A:No unlocking does not have any effect on contract. Q:Which network will be supported after unlocking LG Q7 Plus? A:After unlocking your T-Mobile LG Q7 Plus you can use any GSM network’s sim from any where. Q:Is unlocking LG Q7 Plus legal? A:Yes its 100% legal and allowed by govt and networks. Buyer need to make sure LG Q7 Plus T-Mobile is not hard locked and it has attempts to enter unlock app. Buyer need to make sure that LG Q7 Plus is not reported stolen or blacklisted. Buyer need to make sure that he has given us the right IMEI otherwise you wont get a refund. Why unlock LG Q7 Plus From T-Mobile By LetsUnlockPhone.Com? Here at LetsUnlockPhone, you get a 100% money back guaranty(read refund policy here) along with very esteemy customer service. We are specialists when it comes to unlocking any phone with unlock app (such as T-Mobile, Cricket, Rogers, Fido, Bell, Telus etc) whether you have phone from USA (like T-Mobile, Cricket, etc) or or Canada (Rogers, Fido, Bell, Telus, Fido, Koodoo, Videotron, etc). The unlocking service we offer allows you to use any network provider’s SIM card in your T-Mobile LG Q7+.